* Brahim MOussaten & Mohamed MOussaten, are children of Allal MOussaten, born in Morocco in 1962, and his wife Safia Belhadj, the older sister of Youssef Belhadj . Brahim MOussaten was born in Morocco in 1983 and his brother Mohamed MOussaten a year later. They moved to Spain with their parents and lived in Leganes Suburb in Southern Madrid. In the days before the Madrid Trains Bombing they hosted Youssef Belhadj in their apartment in Leganes. There is no evidence that they had knowledge about the attack. Only after the police found records of phone connections between the MOussaten brothers, Abdelmajid Bouchar and Mohammed Afalah – the MOussaten brothers were arrested, in 02/2005, but released later on bail. Brahim MOussaten & Mohamed MOussaten where charged for being members in a terror organization, the Moroccan Islamic Combat Group (CICM ). 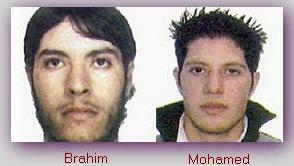 The trial of Brahim MOussaten & Mohamed MOussaten, with other 27 defendants, began in Madrid on 02/15/2007. All the charges against Brahim MOussaten were dropped on 06/06/2007. He was released . unconditionally.